Happy New Year, everyone! I am pleased to announce that we have some great job and internship opportunities available to kick off 2011. Check out recent postings from Weber Shandwick and Burson-Marsteller. Feel free to comment with any questions. The Weber Shandwick headquarters in New York City is seeking an assistant account executive (AAE) for its healthcare practice. Supporting one of the agency’s largest clients, the AAE will be involved with fundamental PR tasks such as media monitoring, analysis and outreach around data announcements and health awareness campaigns. Duties include writing, media pitching, research, report analysis and general account support. Candidates must have strong research and written and oral communications skills. The ideal candidate appreciates science, works well on large teams, is a self-starter and is able to multitask with great attention to detail even in a fast-paced setting. Qualifications include: Bachelor’s degree in Public Relations, Communications, Marketing or similar field; related internships and experience in healthcare preferred. Interested candidates can submit a resume to mnguyen@webershandwick.com. Please list “AAE Healthcare” in the subject line. Weber Shandwick is the world’s largest public relations agency with offices in 74 countries around the world. The firm’s success is built on its deep commitment to client service, our people, creativity, collaboration and harnessing the power of Advocates – engaging stakeholders in new and creative ways to build brands and reputation. Weber Shandwick provides strategy and execution across practices such as consumer marketing, healthcare, technology, public affairs, financial services, corporate and crisis management. Its specialized services include digital/social media, advocacy advertising, market research, and corporate responsibility. In 2010, Weber Shandwick was named Global Agency of the Year by The Holmes Report for the second year in a row; an ‘Agency of the Decade’ by Advertising Age, Large PR Agency of the Year by Bulldog Reporter, a Digital Firm of the Year by PR News, and Top Corporate Responsibility Advisory Firm by CR Magazine. The firm has also won numerous ‘best place to work’ awards around the world. Weber Shandwick is part of the Interpublic Group. For more information, visit http://www.webershandwick.com. 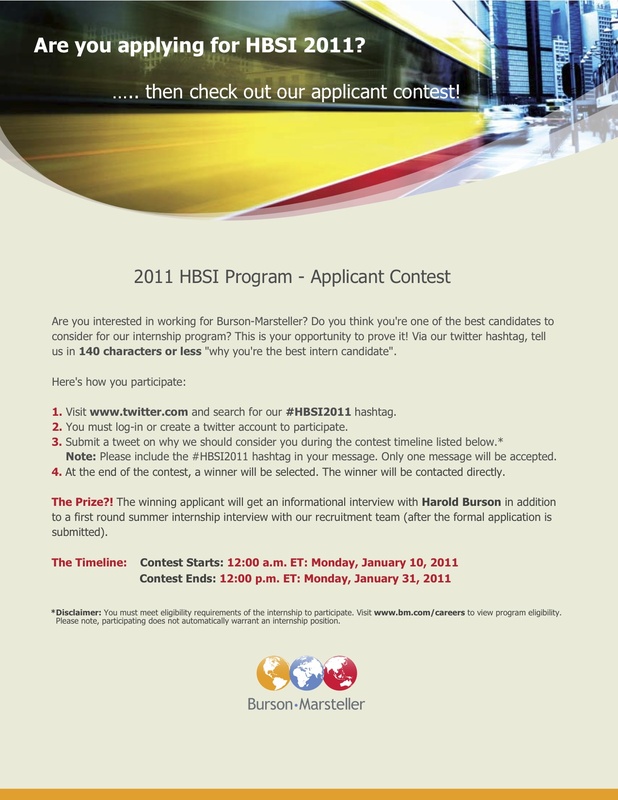 In addition, Burson-Marsteller’s Summer Internship Program is running an exciting Twitter contest for this year’s applicants. Check out all the information in the flyer below. In the meantime, please forgive the appearance of the blog as it is undergoing some construction and visual improvement. Thanks for your patience!